Should I Seek Medical Treatment for My Disability? Home / FAQs / Should I Seek Medical Treatment for My Disability? A doctor’s opinion is sometimes the difference between winning and losing a Social Security Disability case. 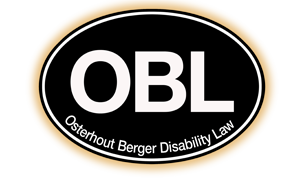 With over 20,000 claims handled and more than 50 years of combined attorney and staff experience, the SSD attorneys at Osterhout Berger Disability Law have seen first-hand the difference a doctor’s opinion can have on a claim for Social Security benefits in southwestern Pennsylvania, eastern Ohio or northern West Virginia. To discuss your medical condition and filing an SSD claim, we recommend scheduling a free consultation with an experienced Social Security Disability attorney by calling us at 412-794-8003 (locally in the Pittsburgh area) or toll free at 1-866-438-8773 (outside the Pittsburgh calling area). You should seek medical treatment and have regular examinations to document your progress or lack of progress. Your medical records and your doctor’s statements will have a profound impact on your ability to collect Social Security Disability benefits. You should also keep a journal, detailing your personal progress everyday; noting progress, setbacks and noting days where there are no changes to your ability to function or work. In addition, when you do see a doctor, make sure you provide him or her with complete information to not only help your medical condition, but also to accurately document it. We also recommend you see a doctor of your choice who is qualified to diagnose and assess your condition, and to recommend the best treatment for it. We know you would rather be pain free and able to perform work and live life in a normal manner. When that does not seem likely, we are here to help you obtain your Social Security Disability benefits. To schedule a free confidential consultation to discuss your claim with an experienced SSD attorney, please call us at 412-794-8003 (locally in the Pittsburgh area) or toll free at 1-866-438-8773 (outside the Pittsburgh calling area). If you prefer, you can fill out our intake form, and an experienced Social Security claims lawyer will contact you to schedule an appointment. Can I Still Work and Collect Social Security Disability Benefits? How Do Other Benefits Affect SSD?